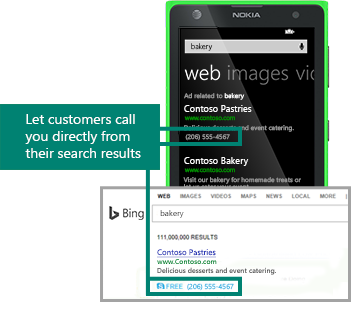 With a Call Extension, you can display a phone number directly in your search ad on PC, tablet or smartphone. Get calls from customers who either click to call or dial the number in your ad. Call Extensions help your ads stand out on the page, giving customers a convenient way to call your business directly from search results — one click to call you is all it takes. More calls mean more leads and faster purchasing decisions. Bing Ads with Call Extensions generated 3-6% more clicks, on average, than those without Call Extensions. When creating a Call Extension, you choose where your number displays and how. A provided forwarding number shows with your ads — you decide if it’s local or toll-free. Call tracking is activated with this option. You get specific tracking and analytics to monitor a range of call and campaign details — call type, duration and area code, for example. Richer customer insight can make optimising your campaign easier (available in U.S. and U.K. only). Your own click-to-call phone number will display. Regular click reporting is available. Calling your business is simple with any device. When making a call using a smartphone, customers click-to-call by tapping your number. On PCs and tablets, they can reach you via a free Skype call — a feature exclusive to Bing Ads Call Extensions. When you use click-to-call, you'll pay only a standard cost per click for each call. A PC, tablet or smartphone call costs the same as a click on your text ad title or URL. Read how to add a clickable phone number to your ad for instructions, then sign in to show your phone number across your campaigns. Want to make your ads even more effective? Help customers easily find your business with Location Extensions, and add Sitelink Extensions to boost traffic and take searchers to specific pages on your site.